And the Jordan's 10-percenter will be rounding out a group that will be reuniting Spieth with the course where he won his first Masters in 2015. Not a bad way to vacation: playing Augusta National as the reigning Masters Champion. Gil Capps, author of The Magnificent Masters and overseer of Golf Channel's Editorial Research Unit, joined us again to recap the Masters and talk about a few other matters with Rod Morri, Mike Clayton and myself. Yes, we are a few weeks past the Masters but this is often the best time to reflect and I think you'll enjoy the discussion. Gil's book on the 1975 Masters is now available in paperback. With the soft launch this year of Masters.com's "Track" feature we were treated to a ShotLink-light system that looked great and allowed us to track players when television wasn't showing them. Or, to see what distances they had off of tees, into greens or on the greens. While the system did not provide ShotLink-type numbers or hole scatter charts, there was this enterprising use of the data on distances by Brian Keogh at the Irish Golf Desk in considering the issues Rory McIlroy faces in adapting to Augusta National's greens. McIlroy, in contrast, totalled 86 feet, 71 feet, 101 feet and 82 feet of putts. In other words, he holed 340 feet worth of putts compared to 410 feet for Spieth. It’s not that the Holywood star putted poorly but any means but while he holed just nine putts beyond eight feet for the week, Spieth holed 16. That's got little to do with McIlroy's overly conservative strategy in a week when soft conditions begged for his usual attacking style. Third Masters Question: Is Augusta National Too Green? A few of you saw my comments on Morning Drive Monday about Augusta National being too green and wanted some elaboration. —It was a strong year for overseeding rye in Georgia. Multiple locals in Augusta, Aiken and Atlanta all said the weather was perfect for a robust rye grass harvest. Three different people tried to insist to me last week that there had to be some sort of synthetic turf mixed into the real turf. It was that deep and dense of a green. —Augusta National has no shortage of resources, including chemical assistance to ensure great conditions. Unfortunately, this also means that the turf is so well fed that even if cut tight by 8 am when the gates open, by the time the leaders go out late in the day on weekends the grass has had 8-12 hours to grow. Lake banks, greens and fairways slow down as the day goes. I couldn’t see mowers doing their thing because we are not allowed on the course before 8, but I’m guessing they were picking up a lot of clippings. —The trend has been for green and making the course play long over all else in recent years to keep ANGC relevant in the face of distance advancements. This year was the deepest green yet, with the annual practice of mowing fairway grain toward the tees creating a huge contrast in looks between the first and ninth fairways. There was almost no roll. I was only at the second fairway a few times, but each time a drive headed to the bunker stopped short thanks to this cut. That makes the course play easier for today’s players, who have extraordinary ball control if they don't have to worry about what happens when the ball hits the ground. —The second cut was true rough this year. It did not appear to be topped off daily and instead of creating problems, saved a lot of balls from going to more trouble. Spieth’s Thursday second shot on 15 immediately comes to mind as one ball that did not end up in a hazard because of the rough. And the second cut continues to strip the place of a certain elegance in spots that one tight cut would deliver. —Sub-Air is overrated. Everyone has that initial demo in mind from several years ago when a large puddle was sucked out of a green as cameras roll. The Sub-Air does a nice job at Augusta National of getting air to the roots, while the installation of a heating and cooling under the greens also plays a big part in the healthy greens there. --The setup was balanced, interesting and more consistent. The committee seemed to have a better balance of fun and difficulty each day, or just a few inches of speed reduction in the greens helped. But instead of their recent tendency to set things up tough for the first three days, only to make Sunday the birdiefest day, they seemed to not be trying too hard to make the early rounds excessive. According to Doug Ferguson, Sunday's final round, produced the lowest scoring average (70.91) of any round in the history of the Masters. No wonder Phil was displeased with himself for not posting a few more roar-inducing birdies. The wisest, most imaginative player still won last week. Spieth and caddie Greller analyzed the course, built a local knowledge base in just two years and his tying of the record is not to be shrugged off just because of the soft conditions. However, Augusta National has lost a little sizzle due to the love of emerald green and the push to keep the course up with the times. A little leaner course would restore some integrity by not so heavily rewarding the players who seek to merely overpower it. We want to see the bombers rewarded, but we also want to see them kept honest. If the ball is running into the trees or down lake banks or even just into positions less advantageous, Augusta National would be even more interesting and demanding. Oh, and the second cut and trees planted on holes 7, 11, 3, 15 and 17 still need to go. Second Masters Question: Where Does The Year Go From Here? When you have a Masters like 2015’s, the rest of the year is all downhill from here. Right? After all, how do you top that leaderboard, winner, ratings, viewing experience and such overall positive impression for the professional game? Here are three reasons I’m not giving up on the rest of the year potentially superseding what we’ve seen to date. The next few months should be fascinating. —No gray May. With the WGC Match Play’s one-off move to May and sporting a new and improved format, we have a fun two-week run featuring future PGA Championship venue Harding Park and a Players Championship with so many top players either on their game or experiencing a renaissance. And then May gets better. The European Tour’s flagship event, the BMW Championship, always entertains in late May. But this year it’s followed by the Irish Open brought to us by Rory and Dubai Duty Free at…Royal County Down. It’s not often you get a top 10 in the world course seldom seen by most of the planet and the field could even be better than the previous week’s BMW. —Chambers Bay Could Be Brilliant Or A Fiasco. I can’t recall a venue that so few players know—except Jordan Spieth and caddie Michael Greller—with so many questions about how the place function. Will it be a masterful, daily puzzle of course setup twists, shotmaking and stunning vistas? Or six-hour rounds, cranky players, goofy shots and a fluke winner? Will players skip the Memorial or St. Jude to get in extra practice rounds? Throw in the Fox Sports debut (though potentially not on AT&T U-Verse), and the intrigue level figures to be high on many levels. —Gullane And The Old Course. July only gets more interesting with the one-two punch of Gullane No. 1.5 and The Old Course hosting The Open Championship. 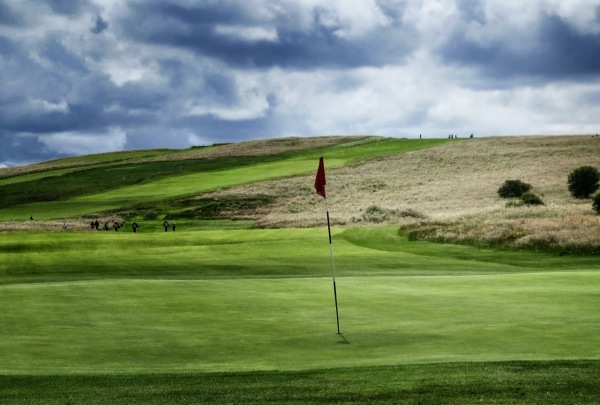 As thrilling as it is to see the game return to the course that started it all—and remain relevant with help from the neighboring courses—the debut of Gullane on the world stage will introduce many to another course instrumental in early Scottish golf. Two weeks of tournaments starting in golf-friendly towns and returning to backdrops of virtual movie sets could manage to top the Masters. What month are you most intrigued by? Forgive me for being late with this one, but I was out at the interview area Masters Sunday and did not hear Bill Macatee's epic reaction to Tiger Woods suggesting he'd popped a bone back in place, nor had I heard the Faldo-Nantz reaction where you can almost feel them looking at each other incredulously. Matthew Schwerha talked to Dr. Benjamin Davis, an orthopedic surgeon in Chicago who says it's possible. You Know Jordan's Win Is Big When SI Pushes Aside The NFL! First Post-Masters Question: Where Will Jordan Not Play Next? The most pressing issue for Jordan Spieth after his Masters win: saying no.